Homi Jehangir Bhabha (October 30, 1909 - January 24, 1966) was an Indian nuclear scientist, known as cheif architect of the Indian Nuclear Programme. 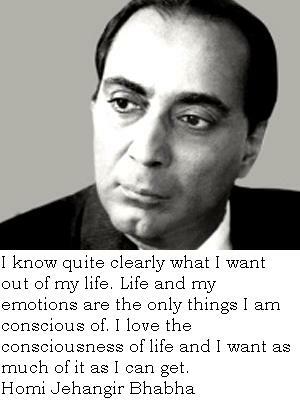 Here I have compiled down some of the famous Homi Bhabha quotes and sayings. Just hope you will like the quote compilation and learn something inspirational from words of Homi Jehangir Bhabha. I seriously say to you that business or job as an engineer is not the thing for me. It is totally foreign to my nature and radically opposed to my temperament and opinions. Physics is my line. I know I shall do great things here. It is absolutely in the interest of India to have a vigorous school of research in fundamental physics, for such a school forms the spearhead of research not only in less advanced branches of physics but also in problems of immediate practical application in industry.